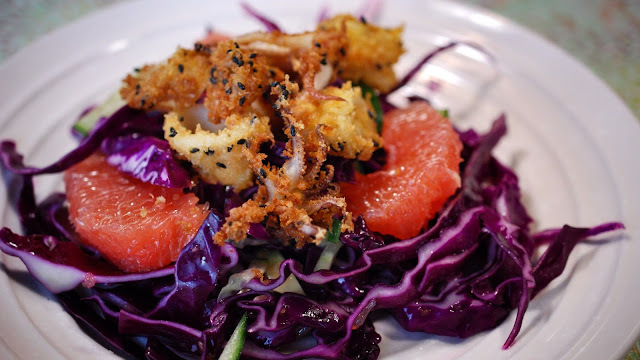 I have another new recipe up this week on WineSpectator.com–8 & $20: Sesame Calamari With Red Cabbage and Grapefruit Salad. It’s crispy, crunchy, and really refreshing. The calamari flew off the plate . . . Greg made sure that there were no leftovers on that front. This left us with a substantial amount of cabbage salad that needed a new home. I used the cabbage salad to make a variation on coleslaw and married that with the idea of tuna salad, and came up with this speedy tuna-cabbage salad wrap for a weekday lunch. I also added one more little embellishment which you might find a little cuckoo, but it really took things up notch. When all the calamari were gone, a small pile of delicious fried panko and sesame crumbs was left in their wake. They were so tasty that I didn’t want to just throw them away, so odd as it may seem, I saved them. I ended up sprinkling them on top of the tuna-cabbage salad the way you might sprinkle breadcrumbs on a pasta dish to add a hint of nutty crunch. Yum. Here's the Sesame Calamari with Red Cabbage and Grapefruit Salad I started with, now up at WineSpectator.com. Here’s the non-recipe for this easy leftover makeover. 1. In a large bowl mix together the tuna, salt and pepper with a tablespoon or two of Greek yogurt–just enough to coat to your liking. Add the cabbage salad and the carrots. Toss it all together. As you mix the salad break up any large pieces that might be left of grapefruit in the cabbage salad into smaller pieces. Taste and adjust seasoning. 2. Warm up as many tortillas as needed–about 30 seconds in the microwave should do it. Mound the salad onto whole wheat tortillas and sprinkle on the panko-sesame. I served it without wrapping, then rolled it up halfway through so that we could have both the salad and wrap experience in one sitting.